The National Genealogical Society Family History Conference will be held in Grand Rapids, Michigan from 2-5 May 2018. Several presenters including myself will be giving talks about Dutch Genealogy (see the full program). I have already heard from several blog and newsletter readers who plan on coming and can’t wait to meet you there. 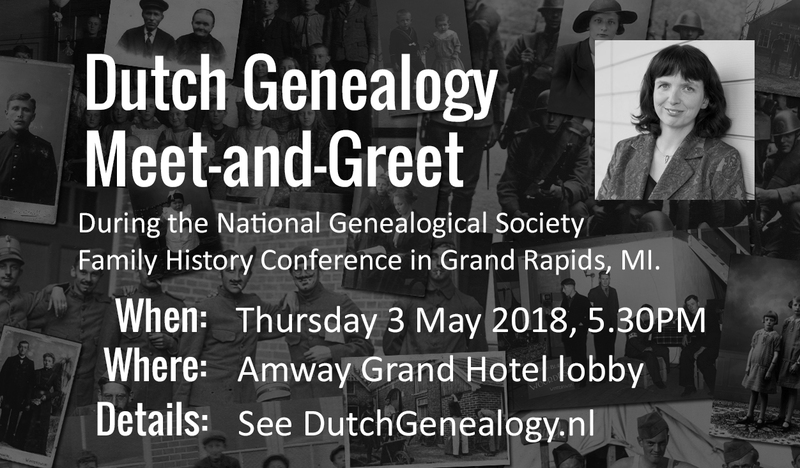 To be able to meet as many of you as I can and to give you a chance to meet each other, I am inviting all Dutch Genealogy readers to come to a meet-and-greet on Thursday May 3, 2018. We will meet in the lobby of the Amway Grand Hotel on 3 May 2018 at 5.30 PM. The hotel is connected to the conference venue (DeVos Place) and is just a short walk away. It will be a chance to connect with people who share an interest in our Dutch heritage and I can answer short questions you may have about doing research in the Netherlands. Note that this is a different location than originally announced. The original location will close early and is not a good place to meet. Fellow Dutch genealogy researcher and NGS speaker Mary Risseeuw will be gathering people in the conference hall (look for the orange sign) and directing them to the hotel lobby, or you can go by yourself. Yvette Hoitink will be waiting for you in the lobby of the Amway Grand Hotel. You don’t have to sign up if you want to come to the meet-and-greet. If you like, you can share that’s you’re going on the event’s Facebook page. The event is unofficial and not affiliated with the NGS conference. Please do not contact conference organizers as they are not involved with the gathering.